Falling. It is often seen as a defeat as a proven inferiority with regard to something or someone. Too many people choose to not choose, so they don't have to pick the risk of the falling, they put their feet on existing footsteps, to feel the sefety of an avoided mockery of a snagged achievement. 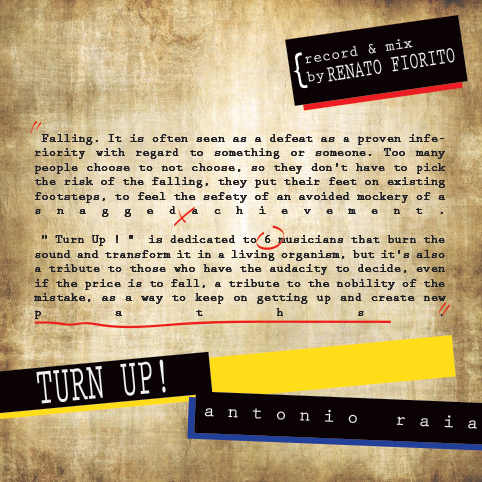 "Turn Up" is a sax solo work by Antonio Raia, it is dedicated to 6 musicians that burn the sound and transform it in a living organism, but it's also a tribute to those who have the audacity to decide, even if the price is to fall, a tribute to the nobility of the mistake, as a way to keep on getting up and create new paths.